Rembrandt Harmenszoon van Rijn (1606-1669), Belshazzar's Feast (detail) (c 1635-1638), oil on canvas, 167.6 x 209.2 cm, The National Gallery, London. Wikimedia Commons. Until relatively recently, many pigments were closely guarded secrets. Their precise manner of preparation, even the source of their ingredients, were considered part of the craft of paint-making, whether performed by a supplier or in the artist’s workshop. On at least one occasion, this led to the loss of a pigment from the palette: Lead-Tin Yellow, widely used in many of the greatest works of art prior to 1750, vanished until its rediscovery in 1940. Lead-Tin Yellow seems to have originated in glassmaking, and there is some evidence of its use as a pigment in glass made as early as about 400 CE. Its earliest use in paintings seems to date back to Giotto in about 1300, following which it became extremely popular. 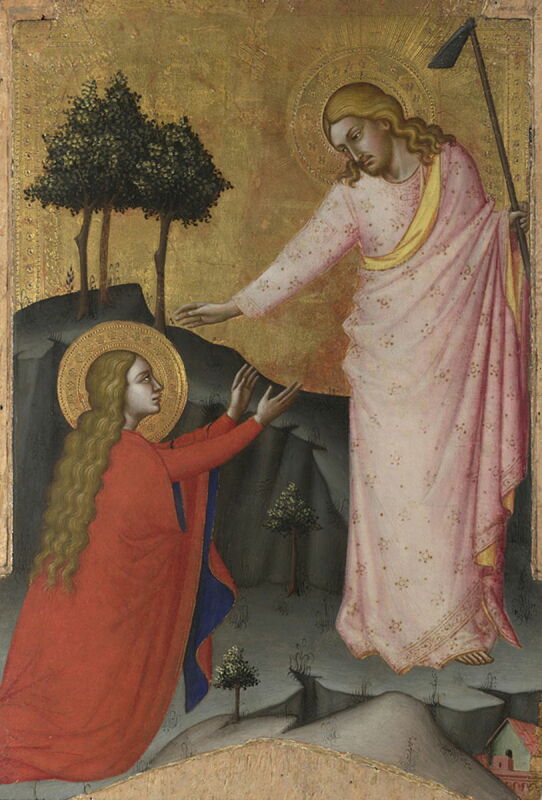 Jacopo di Cione (fl c 1365-1398/1400) (probably), Noli me tangere (1368-70), egg tempera on wood, 56 x 38.2 cm, The National Gallery (Presented by Henry Wagner, 1924), London. Courtesy of and © The National Gallery, London. My earliest example is this painting in egg tempera which is attributed to Jacopo di Cione: Noli me tangere from around 1368-70. Examination of the brilliant yellow lining to Christ’s robe has shown that its pigment is Lead-Tin Yellow of type II. That is a variant which consists of a lead-tin oxide with free tin and silicon which is more strongly associated with glass-making, and prepared slightly differently from the ‘purer’ type I. Both types of Lead-Tin Yellow have proved robust and stable pigments in a range of different binders, including egg tempera and oils. 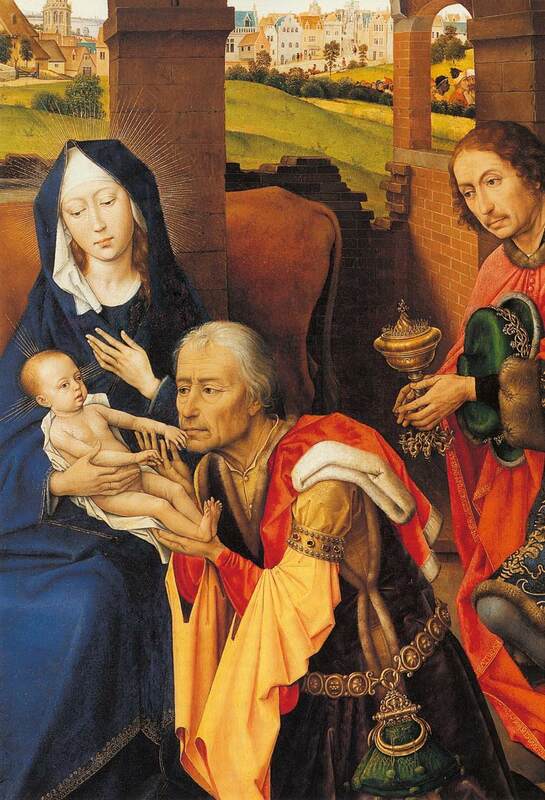 Rogier van der Weyden (1399/1400–1464), Adoration of the Magi, from St Columba Altarpiece (detail) (c 1455), oil on oak panel, 138 x 153 cm, Alte Pinakothek, Maxvorstadt, Germany. Wikimedia Commons. 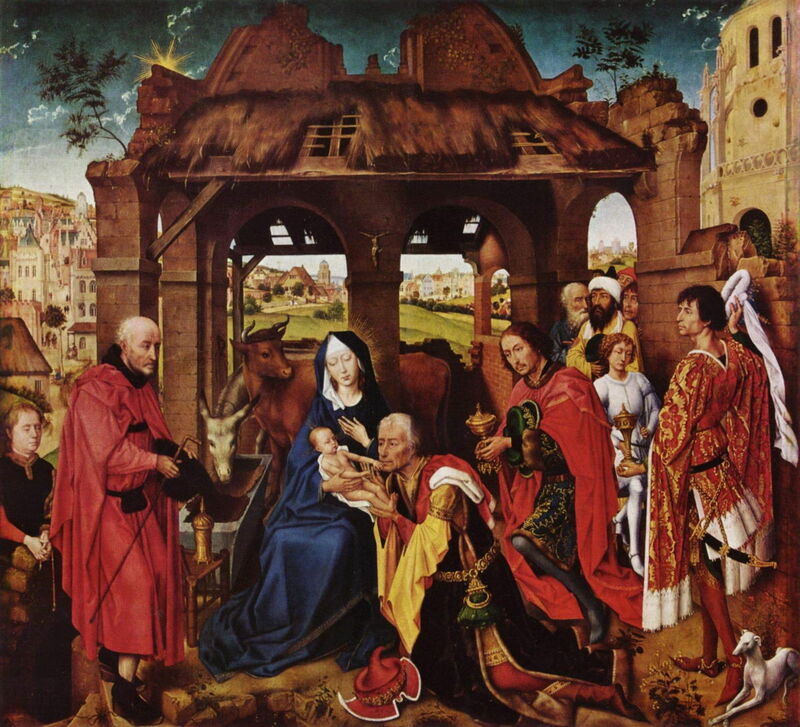 The centre panel of Rogier van der Weyden’s St Columba Altarpiece, showing the Adoration of the Magi, from about 1455, has been found to contain Lead-Tin Yellow in the rich yellow sleeve of the king in the centre. This is shown better in the detail below. Rogier van der Weyden (1399/1400–1464), Adoration of the Magi (detail), from St Columba Altarpiece (detail) (c 1455), oil on oak panel, 138 x 153 cm, Alte Pinakothek, Maxvorstadt, Germany. Wikimedia Commons. Ambrogio Bergognone (fl c 1481-1523), The Virgin and Child with Saint Catherine of Alexandria and Saint Catherine of Siena (c 1490), oil on poplar, 187.5 x 129.5 cm, The National Gallery (Bought, 1857), London. Courtesy of and © The National Gallery, London. By about 1450, Lead-Tin Yellow type I was used increasingly. 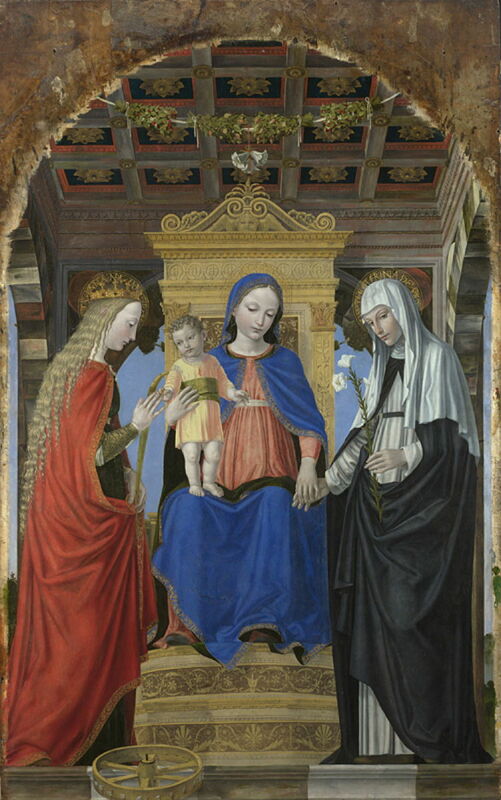 For example, the infant Christ’s lemon yellow dress in Ambrogio Bergognone’s The Virgin and Child with Saint Catherine of Alexandria and Saint Catherine of Siena (c 1490) has been found to contain this ‘purer’ type. 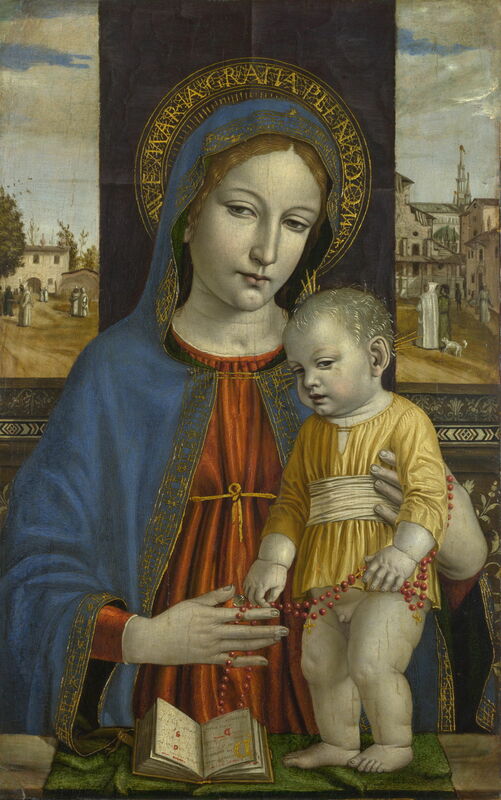 Ambrogio Bergognone (fl c 1481-1523), The Virgin and Child (1488-90), oil on poplar, 55.2 x 35.6 cm, The National Gallery (Bought, 1894), London. Wikimedia Commons. 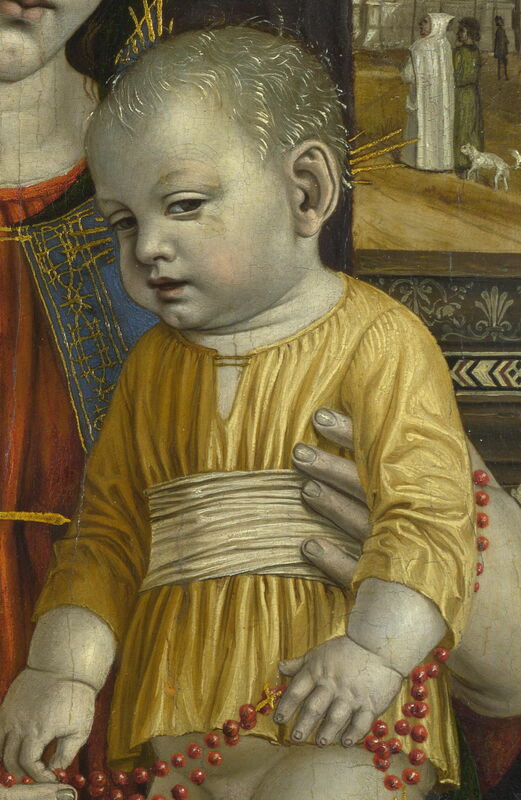 Another very similar painting by Bergognone, his The Virgin and Child from 1488-90, has not, as far as I can tell, be examined to test for the use of Lead-Tin Yellow, but I strongly suspect that the infant Christ’s dress here contains the pigment too. This is shown particularly well in the detail below. Ambrogio Bergognone (fl c 1481-1523), The Virgin and Child (detail) (1488-90), oil on poplar, 55.2 x 35.6 cm, The National Gallery (Bought, 1894), London. Wikimedia Commons. Leonardo da Vinci (1452-1519), The Virgin with the Infant Saint John the Baptist adoring the Christ Child accompanied by an Angel (‘The Virgin of the Rocks’) (Panel from the S. Francesco Altarpiece, Milan) (c 1491-1508), oil on poplar, thinned and cradled, 189.5 x 120 cm, The National Gallery (Bought, 1880), London. Courtesy of and © The National Gallery, London. 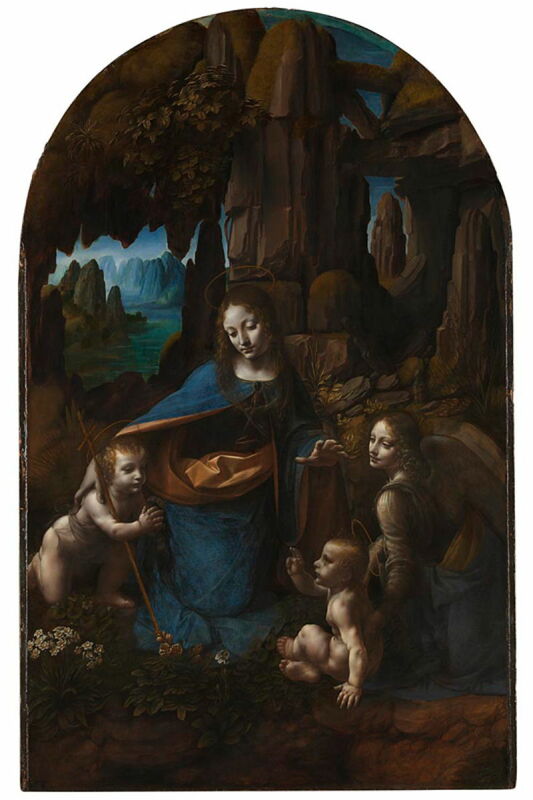 Although believed to be a stable colour, one of the more surprising examples of the use of Lead-Tin Yellow is in one version of Leonardo da Vinci’s The Virgin with the Infant Saint John the Baptist adoring the Christ Child accompanied by an Angel, better-known as The Virgin of the Rocks. The panel from the S. Francesco Altarpiece of Milan, painted between 1491-1508 and now in the National Gallery in London, is shown here. 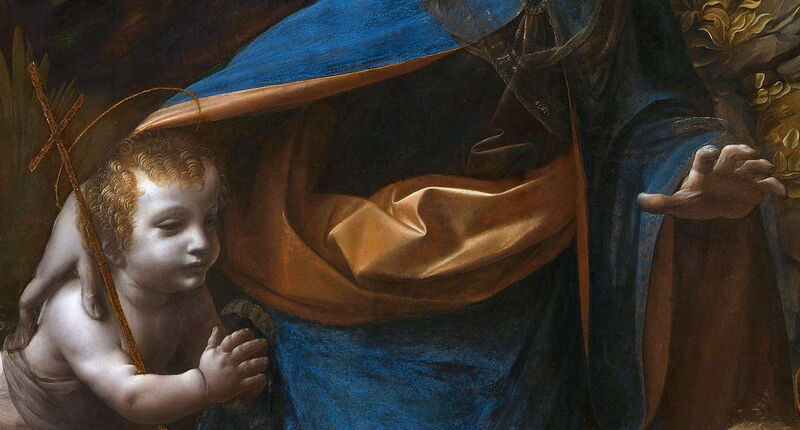 The light brown lining of the Virgin’s blue cloak, shown so well in the detail below, contains Lead-Tin Yellow type I. The version in the Louvre, in which that lining is a bright yellow, doesn’t appear to have been reported on. Leonardo da Vinci (1452-1519), The Virgin with the Infant Saint John the Baptist adoring the Christ Child accompanied by an Angel (‘The Virgin of the Rocks’) (Panel from the S. Francesco Altarpiece, Milan) (detail) (c 1491-1508), oil on poplar, thinned and cradled, 189.5 x 120 cm, The National Gallery (Bought, 1880), London. Wikimedia Commons. Paolo Veronese (1528–1588), The Allegory of Love III, Respect (c 1575), oil on canvas, 186.1 x 194.3 cm, The National Gallery, London. Wikimedia Commons. Yellow is a prominent colour in the paintings in Paolo Veronese’s series The Allegory of Love. In this, the third, Respect from about 1575, Lead-Tin Yellow type II has been found in the primrose yellow impasto on the man’s tunic. Veronese used type I in the first of the series, and type II in the third and fourth, suggesting that he used different sources of supply for his pigments over this period. The two types appear visually indistinguishable, and don’t seem to handle differently in oil paint. Peter Paul Rubens (1577–1640), Hippopotamus and Crocodile Hunt (c 1615), oil on canvas, 248 × 321 cm, Alte Pinakothek, Maxvorstadt, Germany. Wikimedia Commons. 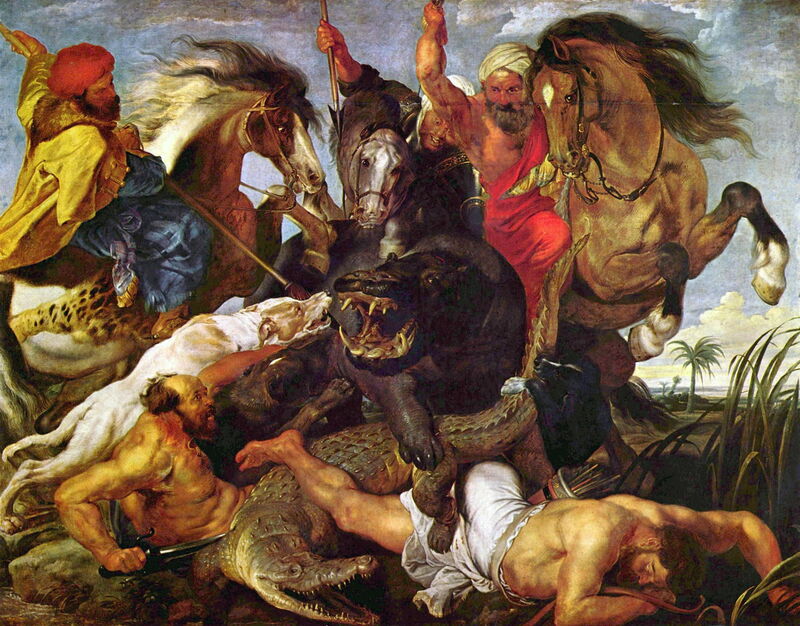 Several of Peter Paul Rubens’ paintings, including his Hippopotamus and Crocodile Hunt from about 1615, have been found to contain Lead-Tin Yellow, although I don’t know which type he used. 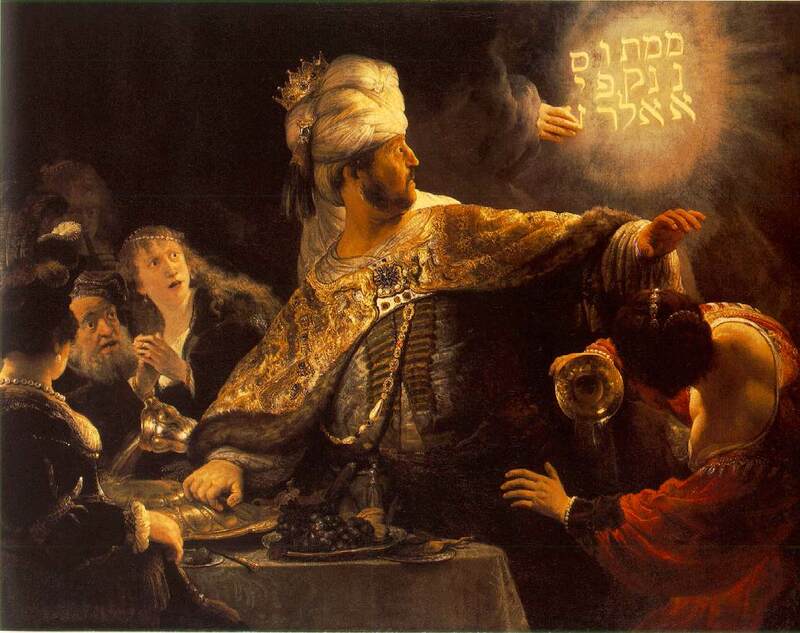 Another fine example of the extensive use of Lead-Tin Yellow, here of type I, is in Rembrandt’s Belshazzar’s Feast (c 1635-38). 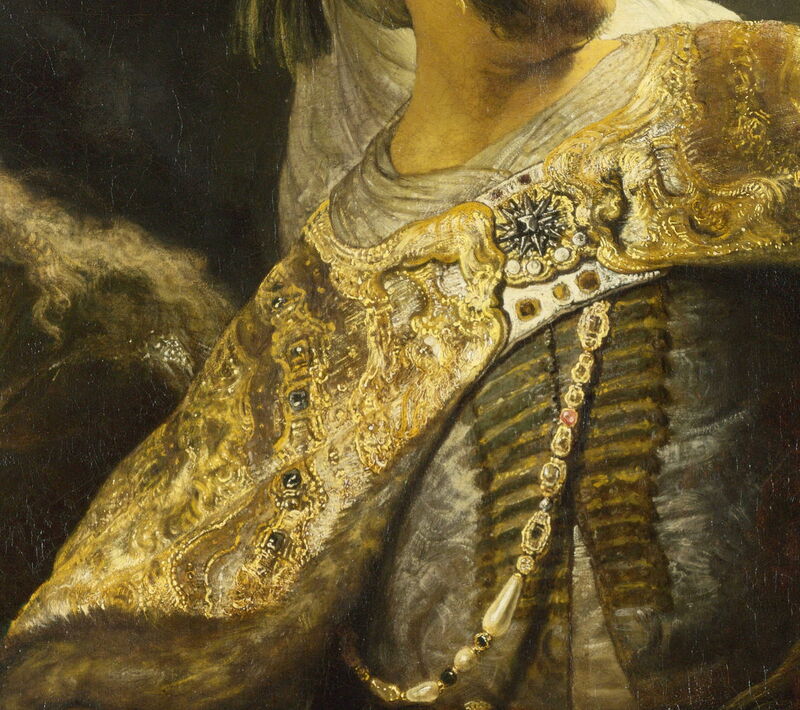 Many of Rembrandt’s paintings have been found to contain the pigment, but here it has been applied in quite thick impasto to model the highlights on Belshazzar’s cloak. Rembrandt here used a double ground, over which he applied earth pigments before applying the uppermost layers of lighter colours, including Lead-Tin Yellow, to model the detail. These are shown in the detail below. Rembrandt Harmenszoon van Rijn (1606-1669), Belshazzar’s Feast (detail) (c 1635-1638), oil on canvas, 167.6 x 209.2 cm, The National Gallery, London. Wikimedia Commons. 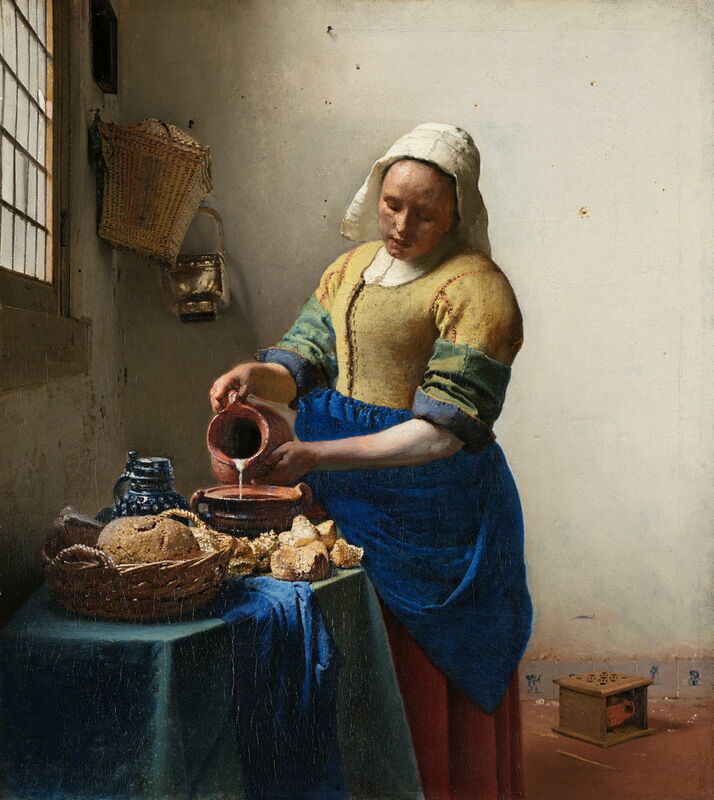 Johannes Vermeer (1632–1675), The Milkmaid (c 1660), oil on canvas, 45.5 x 41 cm, Rijksmuseum Amsterdam, Amsterdam, The Netherlands. Wikimedia Commons. Jan Vermeer is another of the Old Masters whose paintings often contain Lead-Tin Yellow. In The Milkmaid (c 1660), for example, it accounts for much of the pale yellow of the woman’s bodice. What happened next is rather strange. During the first half of the eighteenth century, Lead-Tin Yellow declined markedly in popularity, and by 1750 it appears to have been replaced by other, sometimes less stable, pigments, including Naples Yellow (highly toxic lead antimonate). Once replaced, the recipes for its manufacture appear to have been lost, and its use forgotten. During the eighteenth century, there were also changes in the supply of pigments and paints to artists, and by the nineteenth century most were sourced from specialist colourmen, who appear not to have known about Lead-Tin Yellow as a pigment. When commercial manufacture of oil and other paints became widespread in the late nineteenth century, the pigment was long forgotten. This was aided by uncertainty over its traditional name, which led to confusion with the pigment Massicot (lead oxide or Lead Yellow). It was Richard Jacobi, working at the Doerner Institute in Munich in 1940, who stumbled across the pigment when trying to analyse yellow paints in Old Master paintings. He reported his radical findings in 1941, and from the late 1940s and 1950s onwards paint analyses looking for it have been performed quite widely – and have found its extensive use in works between 1300 and 1750. It has even been re-introduced in some commercial paint ranges. Hermann Kühn (1993) Artists’ Pigments, vol 2, ed Ashok Roy, Archetype. ISBN 978 1 904982 75 3. Posted in General, Life, Painting, Technology and tagged artists paints, Bergognone, da Vinci, di Cione, history of painting, painting, pigments, Rembrandt, Rubens, van der Weyden, Vermeer, Veronese. Bookmark the permalink.